There is a clear need for established standards for medical physics residency training. The com- plexity of techniques in imaging, nuclear medicine, and radiation oncology continues to increase with each passing year. It is therefore imperative that training requirements and competencies are routinely reviewed and updated to reflect the changing environment in hospitals and clinics across the country. In radiation oncology, technology and procedures that were known and avail- able only at the largest academic and research centers in years past—such as image-guided radiotherapy, respiratory-gated radiotherapy, intensity-modulated arc therapy, and stereotactic body radiotherapy—are becoming widely used. In imaging, recent advances include the evolu- tion from film-based to digital radiography, which has resulted in a significant increase in the responsibilities of imaging physicists in the area of informatics. In nuclear medicine, new thera- peutics such as microspheres, alpha-emitting agents, SPECT/CT, and PET/CT are increasingly being used in patient care. 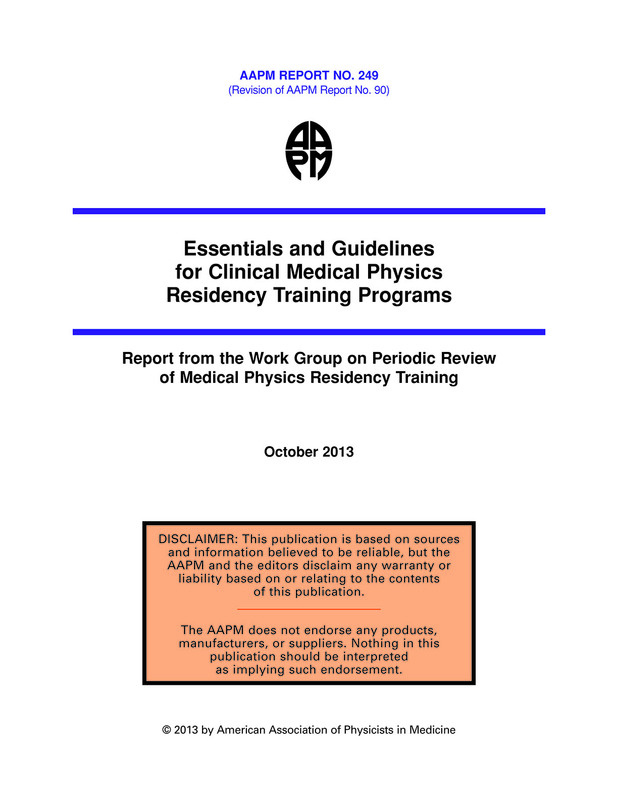 The first AAPM report on residency training was published in 1992 (AAPM Report Number 36) by the Ad Hoc Committee on Clinical Training of Radiological Physicists. In 2003, the AAPM Committee on the Education and Training of Medical Physicists was charged with revisiting and updating that report. This group published their revision of Report Number 36 in August 2006 as AAPM Report Number 90, which concentrated on the clinical and professional knowledge needed to function independently as a practicing medical physicist in the areas of radiation oncology, diagnostic imaging, and nuclear medicine. In 2010, the AAPM Executive Committee asked the AAPM Committee on the Education and Training of Medical Physicists (ETC) to consider establishing a working group to periodically review these essentials and guidelines. In 2010, the AAPM Work Group on Periodic Review of Medical Physics Residency Training was formed and charged with updating AAPM Report Number 90. This work group included AAPM members with extensive experience in clinical, professional, and educational aspects of medical physics. The work group members recognized that the recent publication of the AAPM Report Number 197 (“Academic Program Recommendations for Graduate Degrees in Medical Physics”) and AAPM Report Number 197S (“The Essential Medical Physics Didactic Elements for Physicists Entering the Profession through an Alternative Pathway”) addressed the didactic training requirements of a medical physics resident. This report, therefore, concentrates on the clinical and professional knowledge needed to function independently as a practicing medical physicist in the areas of radiation oncology, imaging, and nuclear medicine. It constitutes a revision to AAPM Report Number 90. It is the sincere hope of the work group that this report will provide clear guidelines and expectations for medical physics residency training for residency programs and residents, and will also serve the medical physics community at large.